The Danish recycling market has been experiencing a real boom in recent years, with MIS Recycling A/S reaping the benefits of this trend. To meet the huge demand, MIS now operate 10 Kleemann impact crushing plants. 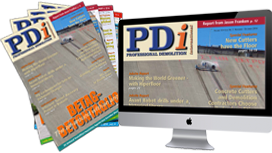 Danish company MIS is playing a pioneering role. Each year, the recycling company processes approximately 3MT of residual construction materials, and 100,000t of natural stone, with one of the most frequent applications being the processing of asphalt. Using impact crushing plants, material is crushed into 0–6mm and 0–20mm sizes, with the final product being returned to the asphalt production cycle. The processing Kleemann crushing and screening plants are transported straight to the desired location, remaining on site for one to two weeks, depending on the size of the project. “The high quality and robustness of the plants impressed us as soon as we started using our first Mobirex 130 mobile crushing plant in 2002,” says Martin Henriksen, director of MIS Recycling A/S. In 2009 MIS decided to buy the latest MR EVO models, and now operate 10 MobirexMR EVO2 plants and 3 Mobiscreen screening plants. “The Kleemann plants just last longer, are more powerful and deliver a higher quality than other crushing plants we worked with,” says Henrik Hvid, MIS production manager. The continuous use of the EVO2 impact crushing plants creates synergies, as MIS operating personnel are very familiar with the plants they do not need to adjust to different technology. 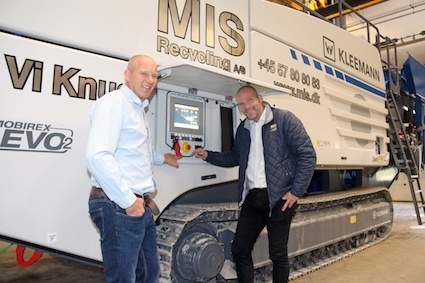 The two latest MR 130 Zi EVO2 plants are also equipped with Kleemann’s new ‘Spective’ control system, which is particularly intuitive to use, and even automates some machine functions. “It’s much easier to use the plants and no explanations are required,” says Martin Henriksen. The next few years are expected to see stricter regulations on the use of screening and crushing plants being implemented in the Danish city centres of Copenhagen, Arhus and Odense. As it gears up for this development, it was important to MIS that the two new MR 130 Zi EVO2 plants met the exhaust emissions standard Tier 4 final. The Scania engine of the plant is fitted with a diesel particulate filter and a carbamide tank in order to reduce emissions of nitrogen oxides, carbon monoxides and fine dust.